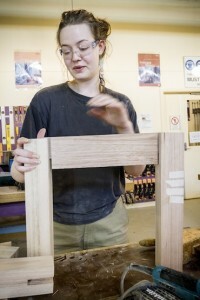 Bianca Murray has discovered a passion for cabinet making. 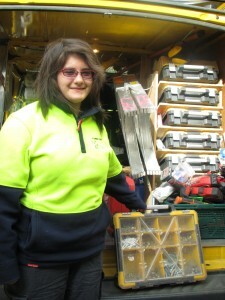 Karren Duri has realised how much she wants to be an electrician. And Maria Polodonis has a real gift when it comes to working under car bonnets. 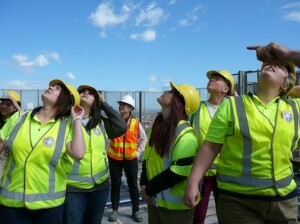 All three are recent graduates from Thornbury Neighbourhood House’s ‘Women in Trades and Technologies’ course. Co-ordinator Sarah Derum says she’s ‘really in awe’ of the way the young women involved have developed confidence and focus on working in a trade. Sarah says that for women, getting into a trade is not nearly as straightforward as it is for men. Entrenched and outdated attitudes and lack of encouragement can be real barriers. In contrast, entering a trade for young men can be less complicated. who are interested in a trade. The course is run in conjunction with Northern College of Arts and Technology (NCAT) at their trade workshops. ‘It’s an amazing, brand new facility where they teach automotive, electrical, building and construction and furniture making. The women are taught how to use power equipment and tools and make a piece of furniture during the course. Guest tradeswomen visit to share their stories and experiences and industry visits give learners practical insights into what’s involved in particular trades. NCAT has a history of running courses for women including a ‘Girls Make It Go’ a course for women working in manufacturing. For the Neighbourhood House, who have a history of working with local women and as a Learn Local provider, an anticipated skills shortage in the building and construction industry seemed an ideal opportunity to look at tailored training for women. A combination of dedicated teaching staff, enthusiastic learners, an ‘amazing facility’ and great food made the course a winner, Sarah says. Once they’ve completed the course the women have a range of career pathways to choose from. Karren Duri aiming for an electrical career. Some take up a practical work placement to get real-life experience of a trade and its particular demands. They can enrol in a 10 week pre-apprenticeship course where they develop skills and confidence and contacts with local employers. Of the seven women who’ve completed the most recent course, four are undertaking work placements, three are enrolling in pre-apprenticeships and two will soon begin automotive and electrical apprenticeships.